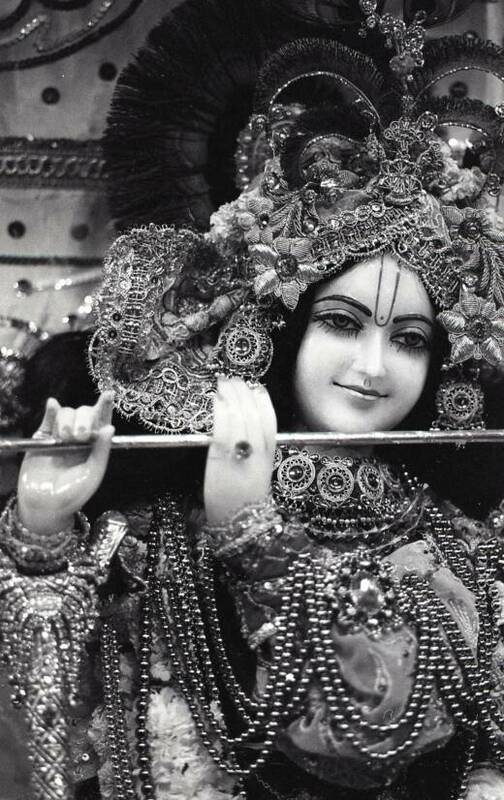 *Click on picture to view Sri Madan Mohan (Lord Sri Krishna) in His full beauty and splendor. "My dear friends, Krishna is so beautiful that the goddess of fortune always remains on His chest, and He is always adorned with a golden necklace. Beautiful Krishna plays His flute in order to enliven the hearts of many devotees. He is the only friend of the suffering living entities. When He plays His flute, all the cows and other animals of Vrndavana, although engaged in eating, simply take a morsel of food in their mouths and stop chewing. Their ears raise up and they become stunned. They do not appear alive but like painted animals. Krishna's flute playing is so attractive that even the animals become enchanted, and what to speak of ourselves." *Special thanks to Gary Paterson for sharing this sublime photo of Madan Mohan from Vancouver, 1978.